When Mysteryland debuts in the US this Memorial Day, May 23-26, it will become the first music festival to inhabit Bethel Woods, New York in 44 years. In August 1969, the town was invaded by an estimated 500,000 people for the now infamous Woodstock music festival. The city and Mysteryland event-promoter ID&T are much more prepared this time around with ticket offerings capped at an exclusive 20,000 guests per day with limited on-site camping capacity. The event hopes to maintain the same authenticity as its predecessor and city leaders are welcoming festival goers with open arms. “We chose ID&T’s Mysteryland brand as the first modern era festival on the hallowed grounds for its belief in many of the same principles as our own organization. Creativity, unity, social responsibility and a focus on the ‘experience’ of the guest. We are delighted to be working with an experienced festival creator and an organization of such high core values. We look forward to welcoming our Mysteryland guests to our wonderful bucolic and peaceful setting here at Bethel Woods Center for the Arts, the site of the 1969 Woodstock festival. We can’t wait to greet them!,” says Darlene Fedun, CEO of Bethel Woods Center for the Arts. When I first heard rumors of an EDM festival to return to Bethel Woods, it was back at the end of 2013. 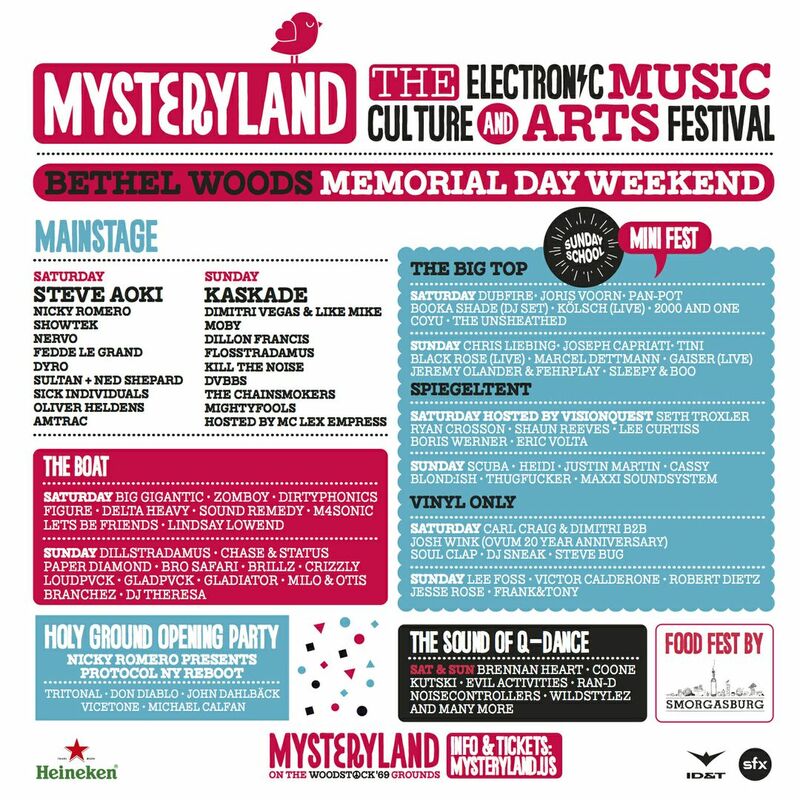 These rumors were finally confirmed in December when ID&T announced it would be bringing its 20 year old festival-brand Mysteryland to the US finally for Memorial Day Weekend, in 2014. Just this week, Mysteryland announced its first USA lineup with popular festival headliners such as Kaskade, Nicky Romero, Steve Aoki, and plenty of bass for any fan. The lineup is lacking a varied selection of live instrumentation, though acts like Big Gigantic out of Boulder are a hot act right now with their blending of live saxophone, drum instrumentation, and electronic beats. I still would have liked to see a couple rap, rock, pop acts to truly pay homage to the melting pot that was Woodstock. Still, ticketholders are in for an interesting experience and I cannot wait to see all the fan videos and pictures from the event.